His Classification of His Pupils. Son of Simon and grandson of Hillel: according to a tannaitic tradition (Shab.15a), he was their successor as nasi and first president of the Great Sanhedrin of Jerusalem. 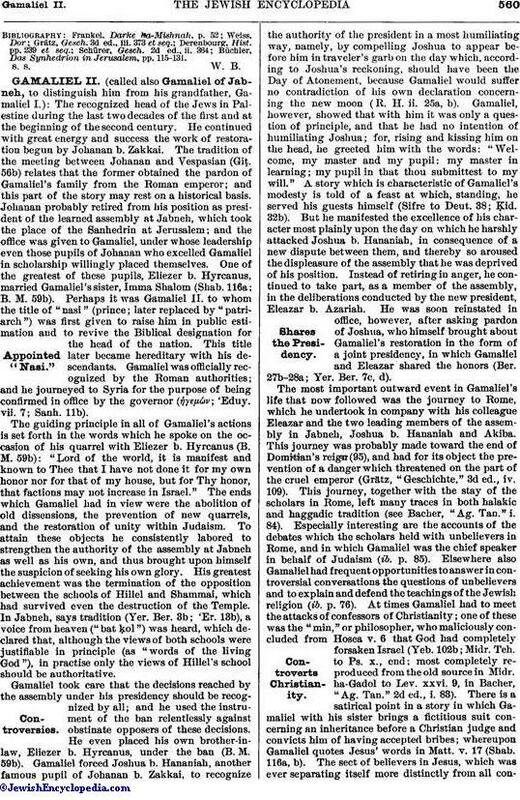 Although the reliability of this tradition, especially as regards the title of "nasi," has been justly disputed, it is nevertheless a fact beyond all doubt that in the second third of the first century Gamaliel (of whose father, Simon, nothing beyond his name is known) occupied a leading position in the highest court, the great council of Jerusalem, and that, as a member of that court, he received the cognomen "Ha-Zaḳen." Like his grandfather, Hillel, he was the originator of many legal ordinances with a view to the "tiḳḳun ha-'olam" (= "improvement of the world": Giṭ. iv. 1-3; comp. also Yeb. xvi. 7; R. H. ii. 5). Gamaliel appears as the head of the legal-religious body in the three epistles which he at one time dictated to the secretary Johanan (account of Judah b. 'Illai: Tosef., Sanh. ii. 6; Sanh. 11b; Yer. Sanh. 18d; Yer. Ma'as. Sh. 56c). Two of these letters went to the inhabitants of Galilee and of the Darom (southern Palestine), and had reference to the tithes; the third letter was written for the Jews of the Diaspora, and gave notice of an intercalary month which Gamaliel and his colleagues had decided upon. 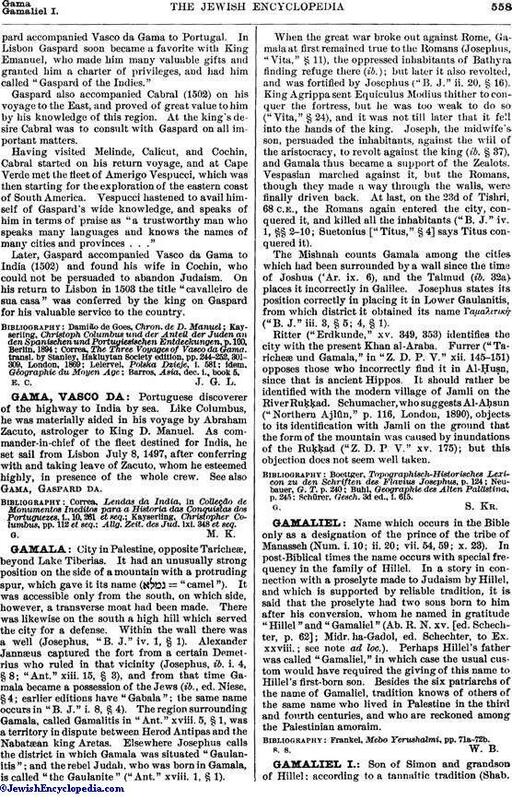 That part of the Temple territory—a "stairway of the Temple mount"—where Gamaliel dictated these letters is also the place where he once ordered the removal of a Targum to Job—the oldest written Targum of which anything is known (report of an eye-witness to Gamaliel II., grandson of Gamaliel I.: Tosef., Shab. xiii. 2; Shab. 115a; Yer. Shab. 15a). Gamaliel appears also as a prominent member of the Sanhedrin in the account given in Acts (v. 34 et seq. ), where he is called a "Pharisee" and a "doctor of the law "much honored by the people. He is there made to speak in favor of the disciples of Jesus, who were threatened with death (v. 38-39): "For if this counsel or this work be of men, it will come to naught: but if it be of God, ye can not overthrow it." He is also shown to be a legal-religious authority by the two anecdotes (Pes. 88b) in which "the king and the queen" (Agrippa I. and his wife Kypris; according to Büchler, "Das Synhedrion in Jerusalem," p. 129, Agrippa II. and his sister Berenice) go to him with questions about the ritual. Tradition does not represent Gamaliel as learned in the Scriptures, nor as a teacher, because the school of Hillel, whose head he undoubtedly was, always appears collectively in its controversies with the school of Shammai, and the individual scholars and their opinions are not mentioned. Hence Gamaliel is omitted in the chain of tradition as given in the Mishnah (Abot i., ii. ), while Johanan b. Zakkai is mentioned as the next one who continued the tradition after Hillel and Shammai. Gamaliel's name is seldom mentioned in halakic tradition. The tradition that illustrates the importance of Johanan b. Zakkai with the words, "When lie died the glory of wisdom [scholarship] ceased," characterizes also the importance of Gamaliel I. by saying: "When he died the honor [outward respect] of the Torah ceased, and purity and piety became extinct" (Soṭah xv: 18). Gamaliel, as it appears, did most toward establish-. ing the honor in which the house of Hillel was held, and which secured to it a preeminent position within Palestinian Judaism soon after the destruction of the- Temple. The title "Rabban," which, in the learned hierarchy until post-Hadrianic times, was borne only by presidents of the highest religious council, was. first prefixed to the name of Gamaliel. That Gamaliel ever taught in public is known, curiously enough, only from the Acts of the Apostles, where (xxii. 3) the apostle Paul prides himself on having sat at the feet of Gamaliel. That the latter paid especial attention to study is shown by the remarkable classification of pupils ascribed to him, for which a classification of the fish of Palestine formed a basis (Ab. R. N. xl.). In this arrangement Gamaliel enumerates the following kinds. of pupils: (1) a son of poor parents who has learned everything by study, but who has no understanding; (2) a, son of rich parents who has learned everything and who possesses understanding; (3) a pupil who has, learned everything, but does not know how to reply; (4) a pupil who has learned everything and knows. also how to reply. These correspond to the following varieties of fishes: (1) an unclean, i.e. ritually uneatable fish; (2) a clean fish; (3) a fish from the Jordan; (4) a fish from the great ocean (Mediterranean). Besides this dictum of Gamaliel's, which is no longer wholly intelligible, only that saying has been preserved which is related in the Mishnah Abot (i. 16) under the name of Gamaliel; for, in spite of Hoffmann's objections ("Die Erste Misclina," p. 26), it is probably right to hold with Geiger ("Nachgelassene Schriften," iv. 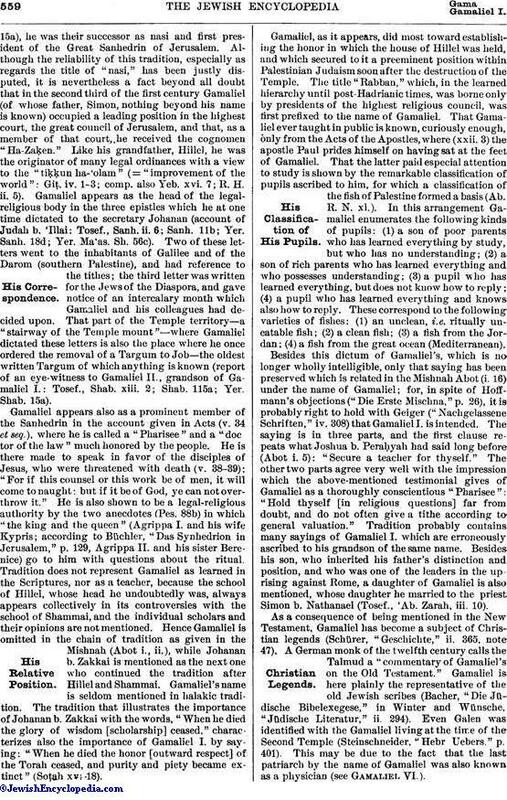 308) that Gamaliel I. is intended. The saying is in three parts, and the first clause repeats what Joshua b. Peraḥyah had said long before, (Abot i. 5): "Secure a teacher for thyself," The other two parts agree very well with the impression which the above-mentioned testimonial gives of Gamaliel as a thoroughly conscientious "Pharisee": "Hold thyself [in religious questions] far from doubt, and do not often give a tithe according to, general valuation." Tradition probably contains many sayings of Gamaliel I. which are erroneously ascribed to his grandson of the same name. Beside his son, who inherited his father's distinction and position, and who was one of the leaders in the uprising against Rome, a daughter of Gamaliel is also, mentioned, whose daughter he married to the priest Simon b. Nathanael (Tosef., 'Ab. Zarah, iii. 10). As a consequence of being mentioned in the New Testament, Gamaliel has become a subject of Christian legends (Schürer, "Geschichte," ii. 365, note- 47). A German monk of the twelfth century calls the Talmud a "commentary of Gamaliel's on the Old Testament," Gamaliel is, here plainly the representative of the old Jewish scribes (Bacher, "Die Jüdische Bibelexegese," in Winter and Wünsche, "Jüdische Literatur," ii. 294). Even Galen was identified with the Gamaliel living at the time of the Second Temple (Steinschneider, "Hebr. Uebers." p. 401). This may be due to the fact that the last; patriarch by the name of Gamaliel was also known as a physician (see Gamaliel VI.). Büchler, Das Synhedrion in Jerusalem, pp. 115-131.